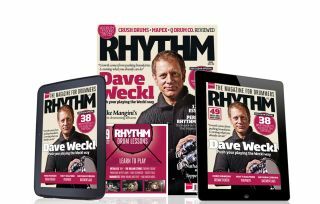 This month Dave Weckl, one of the most remarkable players of his (or any) generation talks about his journey to the top. You can find the issue in all good newsagents, online or digital via the Apple Newsstand and Google Play Store. Head here to getyours now. The 17 essentials you need in your gig bag! With this month's Rhythm lessons you can nail Metallica classic 'One', Stones hit 'Brown Sugar' and Marmozets barnstormer 'Born Young and Free'. Plus there's all of your favourite lessons from Pete Riley, Colin Woolway, Erik Stams, Mike Sturgis, Kyle Cullen, Jason Bowld and Pat Garvey. This month you can win a Bosphorus cymbal worth over £300! All of this and more is in the March issue of Rhythm, on sale now at all good newsagents, on the Google Play Store and Apple Newsstand. Head here to get yours now.